— Jean-Paul Valdes, Business Coach. Embark today on a journey of discovery of mind and body. At Discovery Physiotherapy and Pilates Centre we invite you to gain a better understanding of how your body works. Our signature wellness program taught by professional therapists is systematically designed to combat daily aches and pains. Unbeknownst to us gravity and daily activities put a lot of pressure on our bodies. We endeavour to share with you how pelvic and shoulder girdle stabilisation as well as spinal movements hold the key to healthy back, neck, shoulders. Our mission is for you to have quality movement so you may lead healthy, happy and productive lives. Safe and effective, our program is suitable for everybody ranging from first-time exercisers and those recovering from injuries to athletes wanting to fine-tune their performance. Our program begins first by bringing your body to a more optimum condition where emphasis on breathing and relaxation will leave you feeling refreshed and energised. Discover a positive sense of well-being and enjoy a spring to your step after each session. Our systematic program recognises that everyone has different needs where our knowledgeable and passionate therapists aim to bring out the best in you. Discover strength and fitness unknown to you. Discover a new you today. 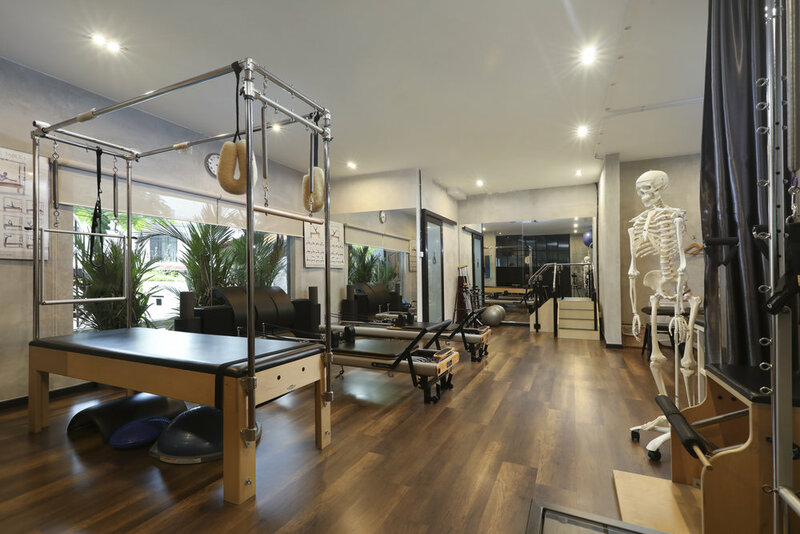 I must compliment you for managing such a clean, professional and well-equipped Pilates studio in the most prominent part of Kuala Lumpur. I really would love to visit your place again and again. It is a highly recommended destination for all. I wish to thank all members of Discovery for making my visit and treatment memorable. I will definitely recommend Discovery for its services and benefits you will gain once you join. Firstly, the ambience of the studio itself. Location is very good with ample free parking. As you enter, it is not like previous centres I went too. The studio is very nicely decorated. I walked into Discovery on 24th Aug as a shaken withdrawn man with all hopes lost. Today (28th Aug) I’m walking away from Discovery with confidence and lost hopes recovered. Thank you. Let's not live in pain.
" A physiotherapist has the brain of a scientist, the heart of a humanist and the hands of an artist." hoW ARE OUR sessions CONDUCTED? New clients to our centre will first of all undergo a DISCOUNTED TRIAL session whereby our therapists will assess your posture and movement through a series of carefully selected exercises. Our unique signature program has consistently produced significant results in terms of pain reduction and how one feels and looks, leaving you feeling lighter, longer, leaner and happier every session! Book your discounted trial session at a time that is convenient for you and our professional physiotherapists and movement specialists will advise you accordingly thereafter. A full session is 55 mins. Bring with you exercise attire and a pair of socks and be prepared to experience a NEW you! New clients will complete our compulsory signature Starter Private Package 4 sessions before entering group classes. Our unique program, systematically designed by founder and director Keath Lau is a safe program suitable for all levels. The program is not only especially effective in combating back, shoulder and neck pains, it also produces speedy progress in just a short period of time. Try for yourself to experience the transformation. After completing the starter package and upon approval from the teacher, clients may decide to attend private/group or both (!) classes. Private classes are arranged at your convenience. All classes are subject to availability. Terms and conditions apply. We work as a team at Discovery to teach our signature programs. You will receive the same quality teaching from all teachers while at the same time experience their own distinctive styles. We reserve the right to substitute teachers without any prior notice. Pilates is great to eliminate backaches often experienced by expectant mothers who have to deal with the extra weight. It also prepares you for motherhood building strong arms and legs to handle the baby, prams, bags etc! Finally Pilates will also help you to shed off the extra pounds you may have put on during pregnancy. Our team of physiotherapists will also give you a thorough assessment of the condition diastasis recti occurred often post pregnancy and often associated with incontinence and pelvic floor issues. — Elizabeth Long, US expatriate. We want you to enjoy your golden years whereby you have the freedom to manage daily activities without aches and pains. Through Pilates with us you shall enjoy an improved confidence in your balance, strength and movement. Pilates is safe, gentle and most appropriate form of exercise for senior citizens. It's never too late to start! Discovery has built me up to enjoy other sports and activities. As a result I feel so much stronger! No treatment for musculoskeletal issues is complete without a systematic exercise program. Discovery signature program is effective in treating modern aches and pains by activating weak muscles and releasing overactive muscles through application of biomechanic principles and utilization of specialized Pilates equipment. In 2016 I suffered from Sciatica which made it very difficult for me to sit, stand or even walk and I needed painkillers to perform my day-to-day tasks - even being in child’s pose was painful! Thank you for teaching me the Discovery method as a means to rehabilitate and rejuvenate my body. With consistent support from the team, I stopped feeling pain in 6 months time and slowly gained back my strength, mobility and flexibility. Now I can put my days of suffering from Sciatica behind me. We love the TRX! We begin by building strong foundation before slowly progressing to more dynamic exercises. Expect a sweaty and fun workout where you will tone and burn. Classes are catered for all levels of fitness. So don't be afraid but do be prepared to work! Excellent class to burn calories and make you sweat! Combined with a healthy diet, it's an ideal class for weight loss and toning. Be prepared to pant! Classes are catered for all levels of fitness. So don't be afraid but do be prepared to work! Balance your higher impact classes with a gentler class to relax the body, mind and soul. Paired with soothing music this is a heavenly class to do at least once a week to return your body to optimal level. Joseph Pilates was a sickly child and thus he dedicated his life into improving his physical strength. Among the many exercise regimes he studied were gymnastics and circus. Many of the exercise repertoire he developed included performing acrobats on the Trapeze Table in mid-air. These are fun and challenging exercises at times rarely performed. But fret not, under the guidance of our experienced instructors you will be brought to the edge of your capabilities. Successfully performing these exercises will boost your confidence and develop a new you. Apart from gymnastics and the circus, Joseph Pilates was also a professional boxer. Thus Pilates was not for the faint-hearted, it was designed by a man for men. Nonetheless it has been largely embraced by women. More and more people of both sexes have however benefited from this wonderful exercise regime. We include boxing sessions in our Pilates sessions too to add variety and dynamics to your workout. Regular boxing sessions will improve your coordination, self-defence skills, overall strength and cardiovascular endurance. Plus it's so much fun! Sharing many similarities, Pilates is a great combination to Yoga. With our wonderfully designed machines, many of the more complex Yoga moves can be better assisted or enhanced. Expect many exercise variations to aid or challenge you. Enjoy the power of breath to experience 'the ultimate bliss and well-being'. Pilates form the right foundation for dynamic activities needed for weight loss. After bringing your body to a more optimal level through our 'healing and restoring' phase we strive to push your limits through our 'discover and fulfill your potential' phase. We have a variety of exercises and equipment to challenge you and keep your workout new and refreshing. You shall feel refreshed yet challenged at the end of the session! Keath has been training clients as a Pilates teacher for over 10 years. He holds a degree in Psychology from the UK. After graduating he pursued performing arts involving himself in theatre and movement. He discovered Pilates following advice from a dance teacher who thought that it would be a good career move. He holds Pilates certifications from Polestar Pilates and Balanced Body as well as Yoga certification from Yogaworks, US. He is also trained in Gyrokinesis® and Gyrotonic® . He worked in Singapore for 3 years before deciding to take a pay cut, returning to Malaysia to share the benefits of Pilates with fellow Malaysians. His mission is to continue educating the public on good movement and healthy lifestyle so we may all enjoy healthy and happy lives. He believes strongly in Joseph Pilates teaching" the first requisite in happiness is physical happiness". Having suffered three major episodes of back pains and seek help from various medical professionals, Keath found that movement and the wonders of Pilates equipment were the only solutions to his chronic back pain. Discovery Pilates by Keath is a unique and systematic movement principles program designed by Keath after his own experience of back pain and gaining a deeper understanding of the essence of the movement. No treatment for back, shoulder, neck pains etc is complete without an active physical exercise program. We are proud to be the authorised training centre for Balanced Body. Balanced Body has been a leader in the Pilates industry since 1976 manufacturing beautiful equipment we see today combining state-of-the-art engineering, materials and technology with a modern understanding of human biomechanics. Throughout the years Balanced Body has forged strong partnerships with the world’s leading Pilates educators, both classical and contemporary. They actively promote and nurture relationships that bring high-quality education to the fitness industry and the medical community, the athletic community and to Pilates enthusiasts. Balanced Body provides Pilates instructor training and continuing education opportunities that are stimulating, personal and deeply rooted in the art and science of movement.